Let’s remember this: There are certain assets that have a lower or no correlation with the rest of the U.S. stock market. These investments are really helpful, but even more so when we’re looking for stocks to buy in an environment where we think most stocks keep falling in price. 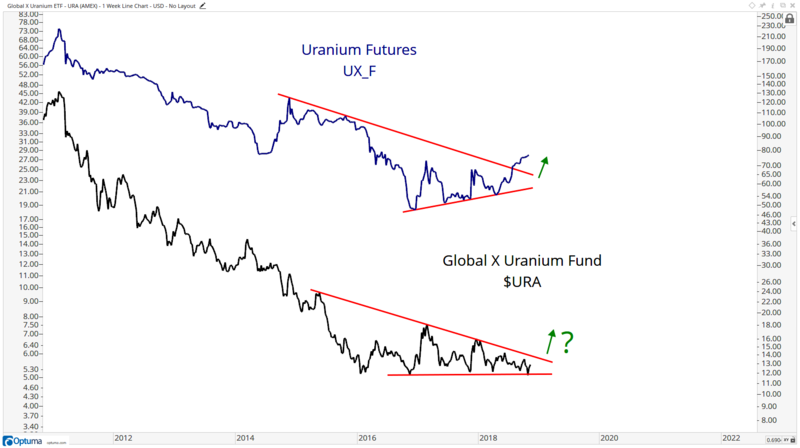 One of these less correlated areas — what’s zigging when the market zags — is, wait for it… the uranium space. Investors in uranium stocks — tied to the nuclear industry and militaries — over the past seven years have been some of the worst stock market investors in the world during that period. Think about this, uranium investors have performed even worse since 2011 than gold and silver investors! That is saying a lot. We’ve already been buying precious metals stocks the past couple of months so it seems like rotation into the worst of the worst areas is happening in unison. Don’t miss out! New trades are released weekly—go here nowto get the latest the moment it’s released. Either way, these are not bearish setups. 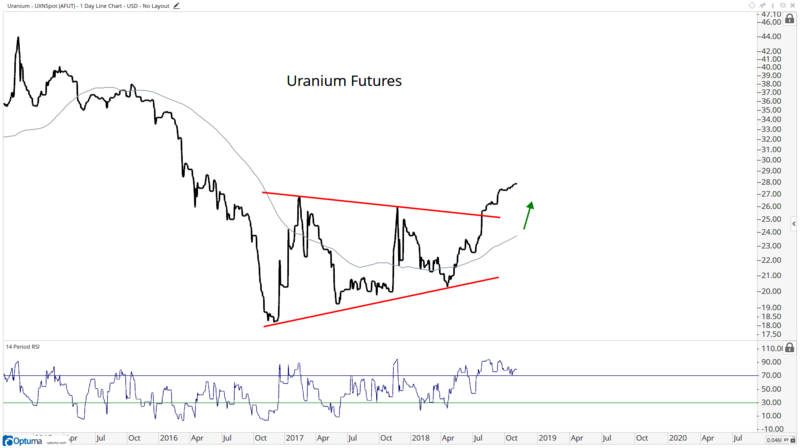 I think if uranium futures are above $27, we need to be long the space. 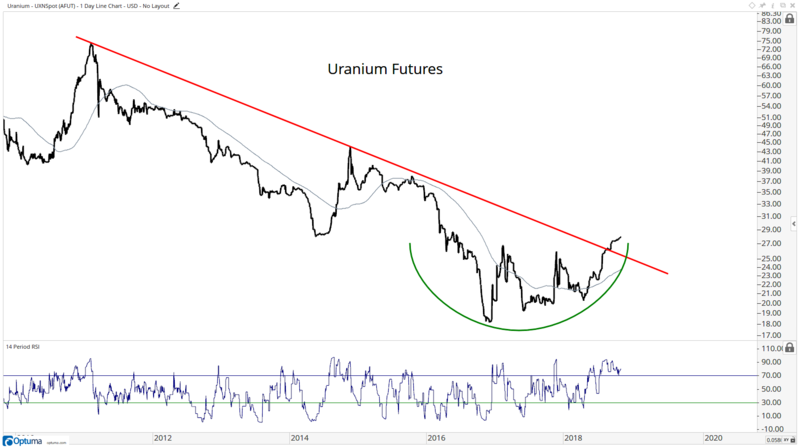 Is this breakout in uranium futures a heads up that we should expect the same from the stocks themselves? 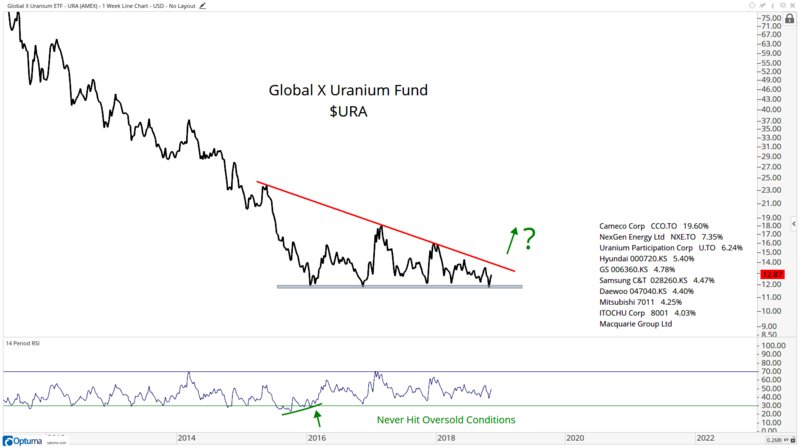 Let’s take a closer look at that Global X Uranium ETF (NYSEArca: URA). It’s been decimated since March of 2011. But notice how on this last selloff, it managed to make a new all-time low, and then quickly recovered. What I find even more telling is that weekly momentum has been in a bullish range for years and prices haven’t been able to break to new lows. Getting back to the 2017 highs represents almost 50% of upside from here. I like that risk versus reward. 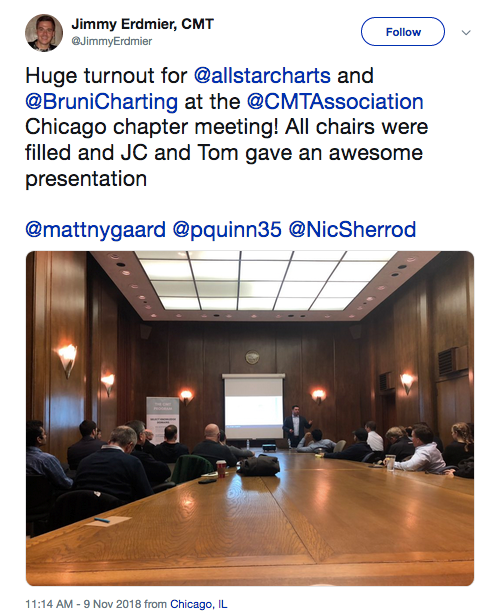 I’ve been in Chicago the last few days with a lot of other math nerds for the local CMT chapter meeting. It’s cold here. But needless to say, it’s been fun. There’s a lot of great food, and it’s always great being around friends like Rob Smith. 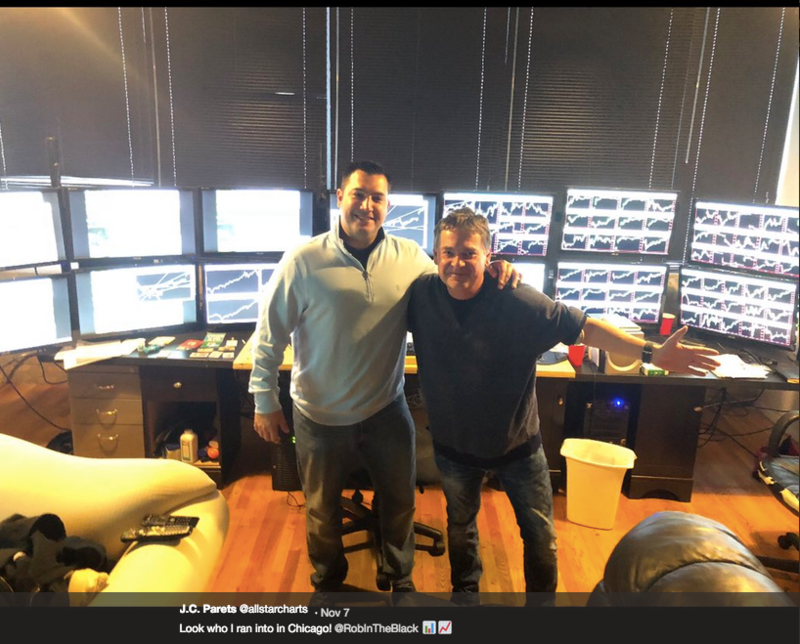 Look at his trading set up. But there’s been business to handle too. Me and Tom did some work this morning.